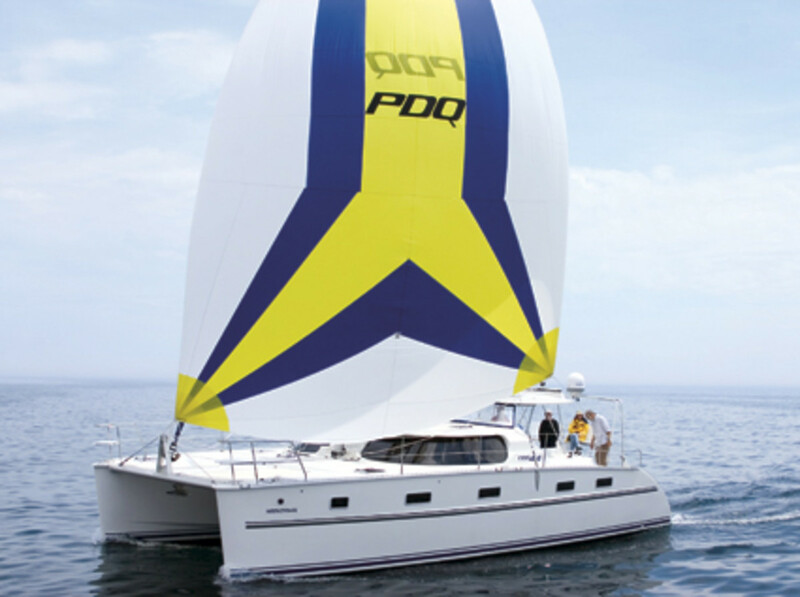 Voluminous cruising catamarans have a reputation for being ideal charterboats, but the boat builders at PDQ Yachts are quick to point out that the new Antares 44i cruising cat is not intended to be a charterboat. Rather, they say, it’s a sturdy, well-equipped bluewater cruiser built specifically for private owners. They also report that the accommodations plan is well suited to long-term living aboard. I jumped aboard an owner’s boat in Miami, Florida, to see if the boat met expectations. It has a minimum bridgedeck clearance of 30 inches to reduce bridgedeck slap. It also has well over 6-foot headroom in the hulls and saloon. As a result, freeboard is substantial but well proportioned. The 44-foot Antares actually started out as a 42-footer, but PDQ’s designers realized that, in order to achieve the proportions they wanted, plus access to the stern steps, the additional 2 feet was needed. The breeze was in the 10-knot range and seas were calm for my test sail. The boat was equipped with high-quality laminated sails and loaded with four months’ worth of provisions (the owners were heading out on an extended cruise through the Bahamas and the Caribbean), full water and fuel tanks, and many prospective Antares buyers. The boat’s rounded hulls are designed to be able to handle extra weight without performance falling off sharply, and I found this to be true. We tacked through 90 degrees and logged speeds in the 4-knot range upwind, rising into the 5-knot range when we turned downwind with the screecher set. Under power, the cat’s dual shaft-mounted 29-horsepower Yanmars maneuvered predictably, and speed under power reached into the 7s. The engines are mounted under the cabin sole in front of the aft cabins. This is good for sailing performance, and soundproofing keeps engine noise in the cabins at acceptable levels. The helm station accomplishes the difficult task of providing excellent visibility over the coachroof without perching the helmsman high above the cockpit on a tall seat. It’s also within easy reach of the central stopper/winch station, allowing the helmsman to trim both main and jib without having to stand. A similar stopper/winch station at the stern handles all halyards and reef lines. There was no evidence of increased friction even though the control lines run through a race under the bridgedeck back to the cockpit. The cockpit has good stowage that includes a large locker built into the cockpit sole and a sturdy stainless-steel dinghy arch (instead of davits) that can support the weight of a dinghy up to 111/2 feet long. Except for the large and airy bridgedeck saloon, the accommodations are in the traditional mode, featuring generous amounts of woodwork and copious stowage. All cabinets, furniture, and bulkheads are made of varnished cherry veneer over lightweight honeycomb core. The sole is genuine teak-and-holly. The result of all that wood is a warm feeling belowdecks that any long-term cruiser will appreciate. Long-term cruisers will also appreciate the layout. Instead of compromising the size of the galley and the saloon by putting the galley “up,” PDQ put it down in the port hull. While the cook may miss out on some of the conversation in the saloon, this is more than made up for by the 15-foot-long space with 15 cupboards and five drawers. The forward-facing nav station is up to offshore standards. It has a large table, good mounting points for electronics, a comfortable seat, and excellent visibility outside. The cabins also passed my liveaboard test. The master cabin occupies the entire starboard hull and is equipped with drawers, cupboards, and a 5-foot-long hanging locker that PDQ calls a wardrobe. The two guest cabins in the port hull (one can be converted into an office) have similar features. This boat should be well suited to extended offshore cruising. And it may help people realize that not all offshore boats are monohulls and not all multihulls are charterboats. Price: $655,000 (sailaway, FOB Whitby, Ontario, Canada). Power (2) 29-hp Yanmar diesels.